If your opponents weren’t afraid of snakes before, the Snake’s Path deck will give them a new phobia! With tons of sss-slithery creatures with sss-super abilities, you will sss-seize control in mere sss-seconds! So begins the introduction to the final deck of our review of Champions of Kamigawa, Snake’s Path. And while Wizards’ copy writer who stuck that in there certainly elicited more than a few groans, if you can look part the corny serpent alliteration you do at least get a general idea of what the deck is about. Like all of the set’s decks, it has a very pronounced tribal/thematic element to it, in this case the snake-like inhabitants of the Jukai Forest, the Orochi. As a people, the Orochi are divided into three tribes: the Kashi, the Matsu, and the Sakura. A common grievance leveled against the Kamigawa block is that it’s so steeped in the Japanese language that it’s hard to keep straight at times, so for those readers it may help to learn that these mean “oak tree,” “pine tree,” and “cherry tree,” respectively. This isn’t just word salad plucked out of a Japanese dictionary, for each of these tribes have a particular character that resonates with the type of tree associated with them. The Kashi (oak) tribe are the warriors of the Orochi, the forest’s heavy infantry. The Matsu (pine) tribe would then be your snipers, scouts, and skirmishers. Finally, the Shamanic tradition of the Orochi is nurtured by the Sakura (cherry) tribe, a tradition which has held a reverence for the kami which now are waging terrible war against the many peoples of Kamigawa. As we’ll see, Snake’s Path draws upon the traditions and ways of all three Orochi tribes, blending them to deadly effect. In concrete terms, the deck is one of those relatively uncommon beasts, the Green Weenie deck. Ordinarily in preconstructed Magic, we tend to see Green decks adhere to the ramp/fattie archetype, using the resources of Green to squeeze out big beaters into the battlefield. Snake’s Path follows the Elves! strategy, eschewing the larger mana curve for a tighter, more focused attack in the early and midgame. Of course, this being a tribal deck, the Orochi have a few tricks distinctly their own. Snake’s Path features a relatively focused mana curve which peaks in the two-drop slot, but that isn’t to say that there isn’t any mana ramping to the deck- it does, after all, have one big mana-hungry surprise waiting for your opponent. Towards that end, you do get a full playset of Orochi Sustainers, plus a trio of Sakura-Tribe Elders. All seven of these are of the Shaman type, which is also something that carries some significance as we explore the deck. By and large, outside of the mana ramping options as well as a few significant legends, the Orochi are small, relatively efficient creatures which may carry a few varying abilities but tend to have a single one in common: anything they deal damage to gets tapped, and doesn’t untap during the next untap phase. Working our way up the curve, we’ll start with the one-drops and the Orochi Leafcaller. The Leafcallers are a bit of an oddity here. They are 1/1 mana filters for – not a bad deal except for the fact that this is a mono-coloured deck. Their filter ability is completely useless here, leaving them no greater than a Merfolk of the Pearl Trident. They’re mainly here to help give the deck a quick start, as they are the only one-drop Snake in all of Champions of Kamigawa. They’ll have a role to play beyond chump-fodder, though it will take the emergence of one ore more of your deck’s legends to help them punch above their weight. Until then, they’re one of the deck’s poorer inclusions. 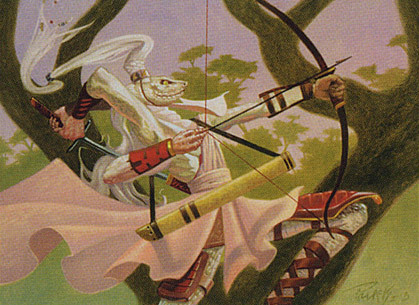 In the two-drop slot we find a trio of Orochi Rangers, which mark the first occurrence of the tap-on-damage ability common to the snake people. As a 2/1, unless otherwise augmented using this lockdown ability is likely to cost your Ranger her life. She also tades out with nearly anything your opponent might play thanks to her 1-toughness, so again she’s a relatively fragile card that needs the influence of others to attain her full potential. A trio of Matsu-Tribe Decoys take up the three-drop slot, and here we find an Orochi a measure hardier than his predecessors. With 3 toughness he can serve as an able blocker, locking down attackers a turn at a time. He also carries an activated Lure ability, giving you just the ticket to set up a lethal alpha strike once you have enough Orochi on the board. With the same consistency we’ve come to expect from the Champions of Kamigawa decks, we see yet another three-of occupying the four-drop slot. The Kashi-Tribe Reaver may not be quite as durable as the Decoy, but her regeneration is a perfect augment for a creature you’ll want to have trading blows with other creatures. Finally, a pair of Kashi-Tribe Warriors round out the top of the mana curve. Relatively sturdy 2/4 bodies, the Warriors too carry the signature Orochi tapping ability to snare your opponent’s creatures. Thus far we have a rather steady selection of creatures, reliable and dependable if lacking in a bit of kick. That’s where the deck’s legends come in, as they have effects which can pump up your entire board. Sachi, Daughter of Seshiro offers a passive +0/+1 ability to all of your Snakes. In addition, she has an added gift for all of the deck’s Shaman, which can now tap to add to your mana pool. As she is a Shaman herself, she also stands to benefit! This can give your deck access to huge amounts of mana, letting you empty your hand and flood the board with creatures. Meanwhile her brother Sosuke, Son of Seshiro is a bit more aggressively-minded. He offers a passive +1/+0 buff to all Snakes, and likewise his Warriors essentially gain deathtouch. On a strictly power/toughness level, Sosuke is your strongest body in the deck, and with enough Warriors in play dropping him can rapidly change the calculus of battle. Finally, you have the Orochi Eggwatcher, one of the set’s “flip” cards. She starts off as a mild-mannered nursery minder, and can churn out 1/1 Snake tokens each turn. If you manage to get ten or more creatures in play, however, her demeanour radically changes as she becomes Shidako, Broodmistress. In this form she adds a truly lethal edge to your deck as she allows you to more or less convert any creature into a Giant Growth. This doesn’t require her to tap, so it’s a great way to finish off a wounded opponent. Simply attack with everything, and if even a single Snake manages to get through unblocked it can grow to lethal proportions straightaway. The noncreature support for Snake’s Path is fairly diverse. You have the combat tricks you’d expect in a Green creature deck, and what the Strength of Cedars lacks in number (you only get two), they make up for in potency. You also have a pair of Serpent Skins, +1/+1 auras with flash that carry regeneration as well. The latter will come in especially handy when you have a Warrior out with Sosuke in play and your opponent sends something mighty and massive crashing through the red zone. Chump block, use Serpent Skin to regenerate your stalwart defender, and the deathtouch will ensure your opponent’s creature doesn’t live to tell the tale. 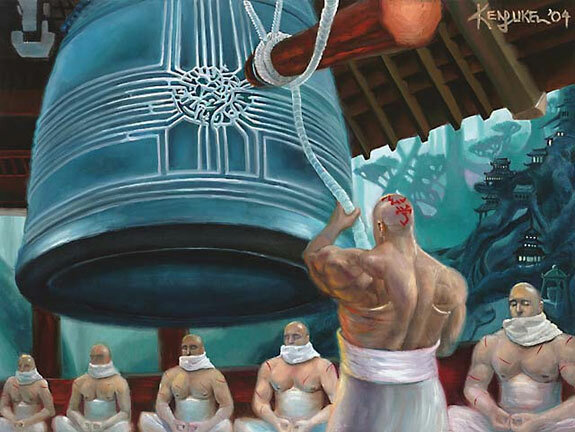 While not exactly a combat ‘trick,’ the Junkyo Bell– one of the deck’s two rares- can also pump an attacker up before it gets sent to battle, a tactic which rewards you for having a number of creatures in play. As you might expect here, removal is something of a difficulty. You have a singleton Wear Away for dealing with a pesky artifact or enchantment, but the only spot removal you have for creatures comes somewhat convolutedly through the pair of Hankyu the deck packs in. These are slow, but they are also reusable so it’s something of a push. As an added bonus, the Hankyu’s damage can be sent at an opponent as well, giving you some extra reach in a pinch. The last few cards defy classification, but you should still get some mileage out of them. Lure is a bit superfluous here, given the presence of the Matsu-Tribe Decoys, and the slot might have been better spent. Still, it can set up a win by drawing all would-be defenders away from your main force, and in a deck full of small-to-medium options such effects can come in handy. Time of Need is a tutor effect which allows you to search for one of your legendary creatures. Remember, flip cards in your library only carry their ‘unflipped’ characteristics, so you won’t be able to get the Orochi Eggwatcher this way. Finally, you have a Sensei’s Divining Top, a $12 card judging by Star City Games at time of writing. This classic engine of card quality all but assures you of being able to grab the best card out of the top three of your library, giving you some draw improvement over the course of the game. Finally, the Orochi Hatchery answers the riddle of where all that Shamanic mana ramping was expected to go- with its expensive casting cost and potentially powerful effect, the Hatchery can let you take over a stalled game through force of numbers alone. Overall Snake’s Path is one of the set’s more interesting decks given its choice of Green Weenie strategy and the mechanics of the Orochi. We’ll put the snake-people through their paces and report back before giving the deck a final verdict! I think it’s kind of telling that the deck insert is the only one in Champions that suggests that you improve the deck by going to other sets for good snakes. There have been fine precons that build around one of their rares (Mirromancy and Grab for Power are two I can think of) , but here, if you fail to draw the Orochi Hatchery, the mana-sink strategy leaves you with a bunch of piddly dudes. This deck is screaming for big daddy Seshiro. The value of this deck is huge. $12 for Top and $1 each for the Elders is really good after all this time. The deck does look a weak, but it does have some nasty tricks with the Hankyu. When the mana is flowing late game, equipping the Hankyu onto an otherwise useless creature, tapping it to put on a counter, and then equipping it to a Matsu tribe member may come in handy. Then again there is always the deathtouch warrior to do this with as well. Interesting deck, though I’d agree that something more should probably be put in to take advantage of the mana. I’ll be interested to see how it plays out. I like this deck a lot. It’s, as you stated, a rather uncommon strategy and the Hankyu as removal was a nice touch. It seems like you can really overwhelm your opponent with a swarm strategy. However, I’d worry that the deck would just flounder if you don’t draw one of your legends or Orochi Hatchery. You’d be left with a bunch of low-powered, inefficient creatures. Anyway, the deck looks sss-seriously cool (sorry). I remember buying this deck specifically for the 3 of sakura tribe elders; elders were arguably the best mana fixer in standard at the time, with kodama’s reach being the contender (loss of damage on the stack-sacrifice and reach’s non-arcane reprint as cultivate tells us who won that battle though). I didn’t know Divining Top was going to be so good when I bought this, so getting one of those became a nice bonus too. The tap on damage gave this deck a nice bit of aggro-control, and the mana ramp helped you get the legends and Kashi-tribes out reliably. Hankyu is a decent, if expensive, trick that gave you something to burn the mana engine on, and eggwatcher/broodmistress was a game winner. That said, this deck has more then a few problems. It has all this mana ramp and not much of real value to burn it on sans the lone orochi hatchery. While it may have been a good set up for a standard deck focused on using kami or monks, as is it’s like a jet engine strapped to an bicycle; you have a quick start but can’t help crashing since you can’t get off the ground. Sousuke and the token engine are begging for the Sosuke’s Summons that won’t show up until next set. Sachi and mana rampers need that Patron of the Orochi who won’t show up until next set. And Junko bell may as well be an index card that says “this space reserved for Seshiro the Anointed”. Ertai nailed it on the head once again for me. I can’t ever make heads or tails of what is going on in the deck because even simple cards have less than simple names. It would be nice to have some less than unique names for those of us in the English speaking countries. Not that I’m biased, I speak three languages, but it adds another level of complexity to the game when you have to adjust to even saying the name of the card. The deck itself does have some synergy and I’m curious about seeing how much the deck costs on places like ebay, etc. I got this deck specifically to put Seshiro, the Anointed in, and he definitely helped. But if you don’t draw him or the Hatchery there’s not a whole lot you can do short of trying to stall. Fun deck when it works though. This deck needs more ninjas. I mean, just imagine: snakes…and ninjas! Now that would be a deck! Am I right, or am I right? Bounce Patagia Viper for Ninja of the Deep Hours. That’s how the pros do it. That’s value. I actually liked R/U ninjas in kamigawa/ravnica standard. Peel from Reality to bounce a sparkmage apprentice and a blocker back to the hand while Tibor and Lumia gives your Izzet Chronarch flying, then sneak it through for Ninja of the Deep Hours and replay the Chronarch next turn to give Deep Hours flying, ping the field, and put Peel back in your hand. Sure Dimir Ninjas were more efficient, but not as much fun. I’m shocked that somehow no one has made a comment about the fact that the Orochi snakes have a member named Sosuke…I’m fairly certain it’s just a coincidence, but still…Naruto much? It’s a very common name. Now that i have a look at this decklist, it seems very well built to me. It must be a funny deck to play, but i doubt about its effectiveness at the field. Now these rares are very cool! I would get this deck only for its rares, i might have to start looking for it ( although that divining top may rise its price a bit more than desired ). I love the flavour of this deck – Orochi tribes of the oak, pine and cherry blossom. I think this deck will definitely be interesting.. I think it’s got lots of options in the red zone, anyway. Just my opinion. Anyone else agree? With the token subtheme (sort of?) Junkyo bell and Hankyu kind of make sense. But with the rest of the creatures, not so much. And I like the snake tribe they constructed in general, using poison to slow and weaken enemies. But the deck doesn’t seem all that focused on its weenie thing and I’m not certain how well it’ll do. Honestly surprised at the lack of Patron, considering how well it fits. The Patrons weren’t printed until Betrayers of Kamigawa. Which naturally brings up the question of why they didn’t hold off on the snake precon until Betrayers… but with so few snakes in the later perhaps they wouldn’t be able to meet the quota? Just seems like poor planning between sets. Ahhhhh, herp derp on my part. Yeah, there weren’t that many later. Although it makes me wonder why they didn’t just include the trio, Sachi, Sosuke and Seshiro, with Seshiro replacing the the Orochi hatchery or the Bell, since they seemed hellbent on showing off the flip mechanic. This deck needs more legends/lords. Also, the decks two rares are lackluster. I love the snake people and their flavor, but this deck has many problems and the tribe in general was rather weak. If you don’t draw a mana sink, all those rampers aren’t doing anything except dying. There also is very little token-making, not enough to support the sub-theme. I am skeptical about the deck’s strategy – especially since a lot of the orochi themselves look severely overcosted, with a rather marginal ability – but I do want to say that I love the orochi caste system, named after different types of trees. The flavour there is beautiful.